Brad Kahlhamer, Bowery Nation (detail), 1985-2012. Photography: Gregory Goode. RIDGEFIELD, CT.- In the late 1970s, Brad Kahlhamer visited the Heard Museum in Phoenix. The Heards mission is Native American arts and culture, and Kahlhamer was drawn there because of a growing interest in his Native blood and a resultant fascination with indigenous American art, particularly from the Southwest. His memories of the visit, however, are primarily not of cultural awakening, but are rather based in a profoundly aesthetic experience. Kahlhamer, who was then in his mid twenties, encountered the Heards extraordinary collection of Hopi katsina dolls, the majority of which were donated to the museum by Barry Goldwater, former Arizona Senator and Republican Presidential candidate. Kahlhamers lifealtering experience with the katsina collection did not so much involve the unique character of each doll, but instead revolved around the overwhelming presence of hundreds of dolls as a group: the cumulative power of the wildly inventiveand often bizarreHopi cosmology. Katsinas are masked and costumed figures that personify supernatural beings that live in the sacred landscape surrounding the Hopis ancestral land in northeastern Arizona. There are hundreds of katsinas in the Hopi pantheon, and specific katsinas are tied into seasonal rituals that occur in an eight-month period from December through July. Small, effigy-like versions of katsinas are crafted by Hopi artists to be given as gifts, particularly to young girls, to act as teaching tools to explain the complex Hopi belief system. 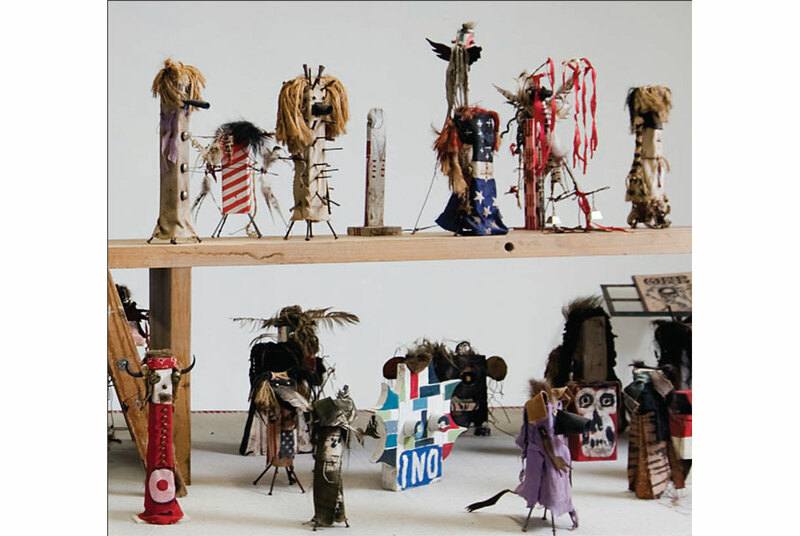 These katsina dolls began to be collected by nonnative people in the late nineteenth century, and they are still produced by the Hopi for both religious and commercial purposes. Kahlhamer started making small, figurative sculptures reflecting his interest in katsinas during a series of fishing trips to the Hudson River Valley in 1985. The artist began cobbling together the works out of detritus such as wire, fabric, and bicycle tire inner tubes that he found in a local basement workshop. His initial impulse was spontaneous and organic: the sculptures were provisional and experimental, with no grand scheme or plan as to their eventual future. There was no attempt to actually replicate specific katsinas, with the nature of the sculptures more reflective of the artists hybrid artistic sensibility than Hopi belief or aesthetics. As the group expanded over the ensuing years, Kahlhamer shied away from exhibiting them publically and began to regard them as companions, strange studio mates that complemented the extensive collection of taxidermy and other objects that informed his practice as a painter. After a move in 1990 to the Lower East Side Bowery neighborhood that has been his home ever since, Kahlhamers alternative tribe slowly grew to its current one hundred figures, with about two dozen additional bird-like companions. The decision to assemble them as a group and finally pursue their exhibition was partially governed by the series having reached the century mark, but also by the fact that, just like Kahlhamers experience at the Heard three decades earlier, the power of the individual dolls is amplified by their gathering. Kahlhamers personal mythology has been made manifest through the truism of strength in numbers. A consistent thread in Kahlhamers work is identity, or rather the juggling of a tripartite identity: his Native-American background, his formative years being raised in a middle-class, German-American family (he was adopted as an infant), and his adulthood in New Yorks burgeoning art world of the 1980s and early 90s. Kahlhamers aesthetic is also hybrid, a combination of his early influences from the world of comics and cartoons, high-art Expressionism, the attitude and style found in punk and the more rough-and-tumble side of country music, and the very American DIY lifestyle of the garage and basement tinkerer. Because he lives in New York City, one is tempted to label the artist an urban Indian, but Kahlhamers connection to Native culture has always been somewhat second hand due to his being raised by adoptive parents. As an adult he has spent significant time with Native people (particularly in the West), but in the present day Indian culture is defined as much by things such as basketball (Kahlhamer is an avid player) and skateboarding as it is by traditional Native spiritual belief. Kahlhamer eschews the stereotypical role of Indian as spiritual being, attuned to and more a part of nature, but his art consistently exhibits a spiritual longing and is frequently touched by the animism found in traditional cultures. Firmly grounded in modern existential angst, Kahlhamers homesickness is as much American as American Indian, reflecting the restlessness (and rootlessness) that has characterized much of American identity. Kahlhamer has spoken of Bowery Nation as an alternative tribe and the fact that the majority of the works individual elements were born on New Yorks Lower East Side (the part of city with the most extensive history of immigration) makes a certain kind of sense. Bowery Nation can be looked on as a small, but tightly-knit ethnic group or clan, owing its spirit to the zeitgeist of New York City as much as to the influence of the inventive vitality of Hopi woodcarvers. The Lower East Side, well before the construction of the New Museum and the recent explosion of galleries, was a focus for New Yorks alternative communities, from Walt Whitman in the nineteenth century to Bela Bartok, Mark Rothko, William Burroughs, Andy Warhol, the Hells Angels (their headquarters is still on East Third Street), Kate Millett, and Eva Hesse in the twentieth; both the artist and the characters in Bowery Nation fit comfortably into this tradition. The individual figures in Bowery Nation share a certain affinity with the personages pictured in the New York street drawings of Saul Steinberg, another artist who was an immigrant to the city. Steinbergs street characters reflect the polyglot nature of New York, and like the figures in Bowery Nation, their style is based on an amalgam of influences, including cartoons, Cubism, and folk art. Kahlhamers work has always had an outsider flavor, and this quality is particularly apparent in Bowery Nation due to the extensive use of non-art materials. Some of the things that comprise the individual sculptures include (in no particular order) rope, coat hanger wire, rubber inner tubes, leather (primarily from a shoemaker on Lafayette Street), found wood, nails, the artists own hair, thumbtacks, oil paint, spray paint, sage, discarded clothing, buffalo hair, bells, and red broadcloth (from a Native trading post in Rapid City, South Dakota). Feathers are used extensively (Kahlhamer has stated that its tough for me to walk by a feather), with their origins including the pigeons of New York, pricey tackle shops, as well as those found by the artist on his western treks. The folk aesthetic in Kahlhamers sculpture, particularly its graphic and material quality, owes a debt to one of the artists other obsessions, handmade fishing lures from the 1940s and 50s. Kahlhamer has an extensive collection of lures from this period (a time before mass production took over the fishing paraphernalia industry) and their inventive use of form, their material palette (besides feathers, animal hair was used extensively), and their lively, cartoon-like painting deeply inform the visual vocabulary of the artists work. Contemporary pow-wows are events where Native people (often from different tribal groups) gather for intense dancing, drumming, and singing competitions that last from one day to as much as a week. The pow-wow performers dress in elaborate outfits that reflect their tribal identity and history, and most pow-wows include Fancy Dancers who wear vivid costumes that features bright colors and a range of traditional materials like feather bustles, beads, bells, and sheep hair in addition to modern materials such as plastic and synthetic fur. Kahlhamer has frequently attended the larger pow-wows, including the Crow Fair that occurs annually near Billings, Montana, and North American Indian Days held adjacent to the Blackfoot Reservation in Browning, Montana. These festive events incorporate parades with floats (often made from hay wagons or flatbed trucks) and include contingents of military personnel and veterans, tribal officials, and tribal members dressed in pow-wow regalia, war bonnets, reservation hats, and extravagant beadwork. The form taken by the pow-wow floata repurposed vehicle crowded with costumed figuresprovided Kahlhamer with the inspiration for the mass display of his growing tribe of small sculptures. A table-like platform was constructed out of repurposed studio furniture, including saw horses, an old painting table, a step ladder, plywood, and wooden benches, its surface covered with raw canvas that Kahlhamer has hand-stenciled with his Bowery Nation logo: a skull dressed up in a feathered war bonnet. The edge of the platform has been draped in color copies of the shopping bag supplied by the Lakota Thrifty Mart in Eagle Butte, South Dakota, a convenience store owned and operated by the Cheyenne River Sioux tribe. The Bowery Nation logo and the Thrifty Mart logo slyly acknowledge both the worlds of artistic authorship and corporate sponsorship, dragging the works overall ethnological associations into our present environment of consumer culture. Besides the Native American and folk sculptural associations, Bowery Nations lineage includes Modernisms incorporation of bricolage, a French term that refers to the technique of making creative and resourceful use of whatever materials are at hand (regardless of their usual purpose). One of the best-known Modernist works to use bricolage is Alexander Calders Circus (192631), a miniature circus ring that incorporates seventy small figurative sculptures and over one hundred accessories such as flags, nets, and trapeze equipment, handmade by Calder out of materials like wire, cork, and fabric. Calders Circus, however, was made for the sophisticated entertainment of both adults and children, while Kahlhamers bricolaged tribe, as playful as it is, has darker overtones. These beings dont seem to inhabit the peaceful, high desert mesas of the Hopi, but rather the arid apocalyptic landscape of Mad Max, where bricolage is used as a survival tool rather than a pastime. In the collection of the Smithsonian Institution in Washington is a remarkable katsina made in the 1930s: its head is unmistakably that of Mickey Mouse. Even eighty years ago the larger world culture was infiltrating and mutating Hopi tradition. Similarly, Kahlhamers Nation is standing between two worlds: that of the past and that of the future. The cloud of birds that Kahlhamer made to accompany his rag-tag tribe is not comprised of innocent, twittering songbirds, but rather spirits attending an act of creation and evolution.